Nihonbashi Funasa: Let me show how we make our secret tsukudani. Today we’ve come to the factory of Nihonbashi Funasa, a tsukudani shop with a very long history. Nihonbashi Funasa was founded in 1862. It’s a famous shop that has been making tsukudani for over 150 years. I love tsukudani, but I’ve never seen how it’s made before. I’m looking forward to seeing it. Welcome! I’m Miyauchi. Let’s go into the factory and get started! First of all, please look at a specially made gas burner that the pot goes in. 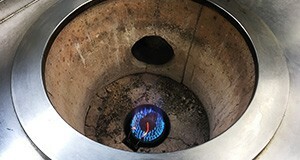 When putting the pot in the gas burner, the fire wraps around the entire pot. The fire power is 10,000 kilocalories. In addition to the high heat of the burner itself, it’s cooked to a finish with the heat of the pilot burner at the bottom after the fire is turned off. It’s really thought out well! Let’s start with making asari clam tsukudani. First, put the boiled clams (without the shell) in a well-washed pot, add ginger grown in Tochigi and then add two kinds of soy sauce, brown sugar and white granulated sugar, and finally put on high heat. The soy sauce and ginger smells nice! After it boils a little bit, add a broth that is a combination of four different sauces(broths) made when making tsukudani. 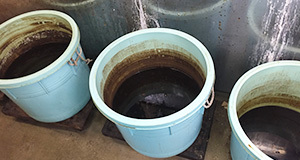 There are four types: broth for fatty ingredients like freshwater and saltwater eel, broth for shellfish, broth for vegetables like burdock and lotus root, and kelp broth. Could this sauce be Nihonbashi Funasa’s secret flavor?! It’s not a secret, but we’re the only ones who do it this way in Tokyo. The broth contains soy sauce, so it can ferment soon and it’s difficult to manage. That’s why others can’t imitate it. Add the boiled asari clam soup to the four sauces, and after measuring and confirming the concentration with a densitometer, strain it with a strainer, and add it to the pot of boiling clams. When it comes to a boil, adding the sauce will cool it down a bit. Yes. This will boil up again, and when the bubbles become finer, I’ll add the sauce start again. I’ll repeat this five times while simmering it for about one hour. 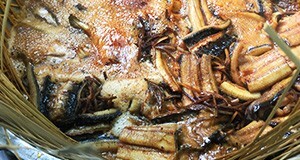 While boiling the asari clams, now we’ll make eel tsukudani. Here we use white grilled eel from Kumamoto. I’ll cut this into three to four pieces, and boil it together with raw sansho from Nara and burdock from Aomori. 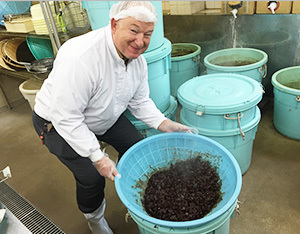 The seasoning is a 7:1:1:1 ratio of soy sauce, eel sauce, sugar, and akazake. They often drink this akazake in Kumamoto during New Year’s. There’s some secrets of the sauces once again! Here you use sauce made from boiling the eel. For eel tsukudani, in order to keep the eel from falling apart when boiling, you put it in a bamboo basket and then add the heat. Boil it for one hour like this, then remove the heat and let it sit for three minutes. Three minutes! That’s something a real pro would say. Lastly, I’ll make whitebait(shirasu) tsukudani. 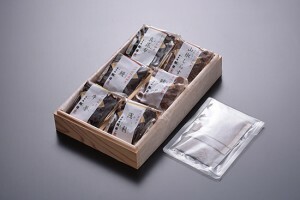 Our stock of dried shirasu was collected in Nobeoka, Miyazaki. Both the size and the taste are the best for making tsukudani. 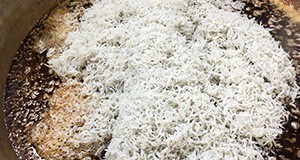 The dried whitebait looks really nice! Making this is not so different from making the asari clam tsukudani. This time, you’ll be adding a whitebait sauce from the four types of sauces to make it. It’s the same for each tsukudani, but you don’t mix it so much when boiling it. It seems that the broth gushes, and you leave it up to convection. That’s right. We just have to wait while watching over the condition of the broth. Just waiting… It seems a little bit philosophical. Well then, let’s wait. The asari clams which I boiled at the start are ready. And the remaining broth is combined into the asari clam sauce! It’s finished. How about having it with some freshly cooked rice? It’s delicious… I can clearly taste the asari clam flavor and there’s also an aroma, but I wouldn’t think you’d have to boil it for one hour with that intense heat. Tsukudani comes with hidden sweetness. Japan has a variety of ingredients available in each of the four seasons. I think I’ll be successful if I can pull out the flavors from deep within the ingredients. 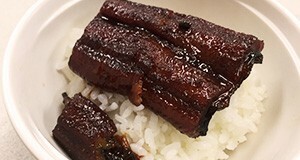 Now, the eel has finished. You can also try ochazuke with this one. Eel tsukudani is also great! By the way, you didn’t taste it while you were making it. Tsukudani is not a food that you should eat on the day you make it. For example, there are some people who eat it after 60 days. The flavor will be different from what we tasted right now, so I try not to believe my tongue. Thank you so much for showing everything to us today, and thank you for the wonderful food.